Let us tailor your experience at London Lakes or on a trip to remote waters. 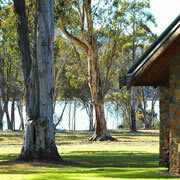 Accommodation, food and wine, guiding, equipment and registered 4WD transport are inclusive in our rates and packages. Importantly......, London Lakes usually fishes well even at times when trout are difficult to find in surrounding public waters. 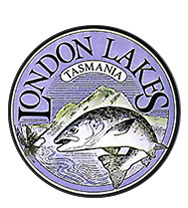 London Lakes is a 2 hour drive from Hobart, the capital of Tasmania, in the south or Launceston in the north.The outstanding fishery was purchased in late 2003 by a group of families from Sydney who have refurbished the Lodge and farmhouse to create superb accommodation. 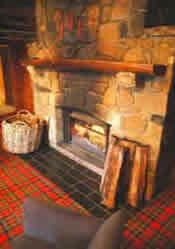 The Lodge and property were closed while improvements were made. The highland stream that connects our two lakes has been extensively developed and now has over 40 well stocked pools and meandering runs to challenge experienced, active fly fishers. Comprising 4,200 acres of unique high country, this place is untamed private wilderness that combines luxury accommodation with unsurpassed trout fishing. Its exclusivity is emphasised by prolific native Tasmanian wildlife including Tassie devils, marsupial quolls, wombats, wallabies, the fascinating egg laying platypus and the intriguing echidna or spiny anteater. The bird life is unsurpassed and includes the endangered wedge-tailed eagle. In many ways, London Lakes is unforgettable. 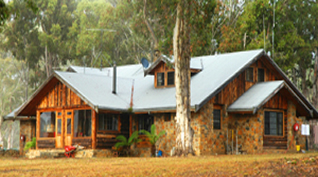 For thirty years, we have had Australia’s premier International standard fly fishing lodge. This has accommodated thousands of delighted guests, while providing the highest quality of Tasmanian gourmet food to fishers, wine travellers and wildlife enthusiasts. Situated on the shores of Lake Samuel, the lodge is small and private, handcrafted from Tasmanian timbers and field stone and designed around a huge central stone fireplace to create a warm atmosphere where tales during and after dinner can be shared between enthusiastic guests. However, because it is used regularly by the owners, the Lodge now is less frequently available and reserved for groups rather than individuals. Fortunately, high class, comfortable, alternative accommodation is provided by the original but refurbished London Marshes farmhouse overlooking Lake Big Jim. 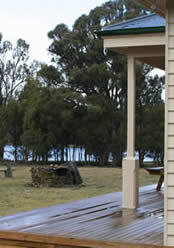 This farmhouse can accommodate up to eight guests in four twin bedrooms. It literally is a stone's throw from one of our best tailing shores. From the front verandah, guests can watch large, wild brown trout rising or tailing in Farmhouse Bay before strolling a hundred metres or driving less than a kilometre to Levett's Bay, where they can experience sight fishing that is reported consistently by our guests as being the world's best. While fly-fishing for wild Tasmanian brown trout is the premier attraction, there are a number of different activities available. 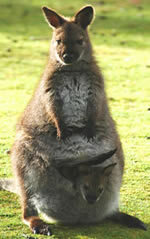 London Lakes is home to a host of native fauna that can be seen up close in their natural, undisturbed habitat. A guide can show you in detail or you can explore for yourself while breathing the fresh air and leaving behind unwanted distractions. 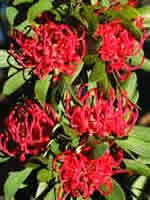 native waratah flowers brilliantly across the estate during spring. a friendly local... ....wallabies can be seen throughout the day. They feed from the hand around the lodge and farmhouse.